We're sorry. We're experiencing technical difficulties. This uniquely versatile refrigerator offers 5 doors, including 2 soft-close drawers; to deliver optimized organization. It features the Preserva Food Care System which uses two independent cooling systems to help keep food fresh longer. A dedicated herb storage compartment takes good care of fresh herbs to give your recipes the flavor you deserve. You will need Adobe® Acrobat® Reader to view PDF documents. Download a free copy from the Adobe Web site. Does it have a ice maker. Does it have an optional second ice maker in the freezer? Is this a true 36 inch wide? Most that fit a 36 inch space are actually 35.75 wide. Hello WannaKnow! Yes, this model is 36&quot;. Thank you for your inquiry on our KitchenAid appliances. Does the water dispenser shelf pull out to accommodate a water bottle or tea kettle? 25.8 cu. 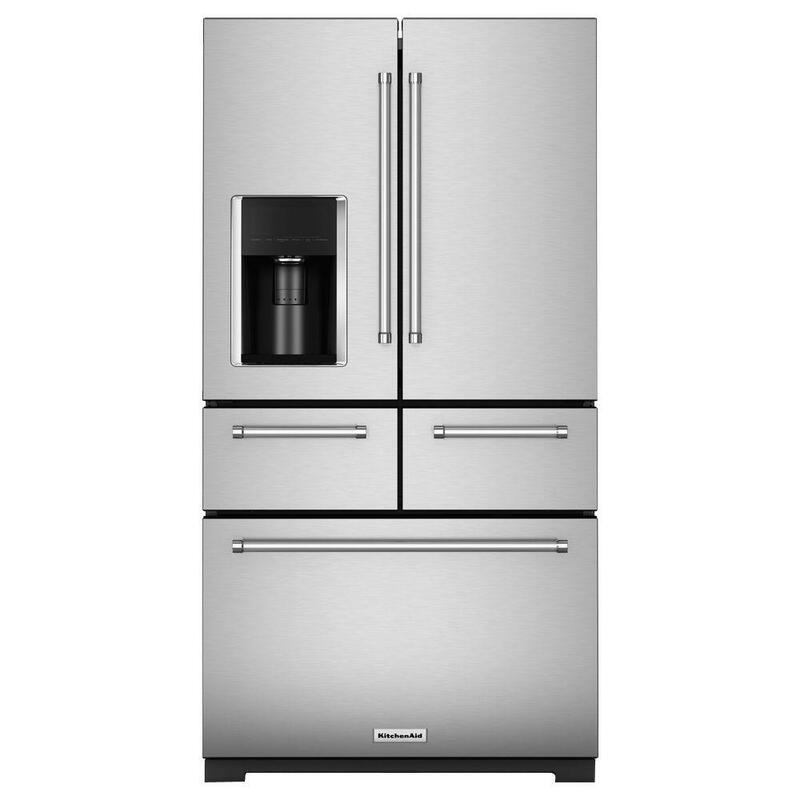 ft. French Door Refrigerator in Stainless Steel is rated 4.0 out of 5 by 369. Rated 1 out of 5 by Edwinp from Freezing problems Dont reccomend this refrigerator. Everything was working perfectly fine and we were happy with it. But just in 2 months the freezer started producing frost we had someone come and fix it, but once again the freezer started building up frost. Then one year later the freezer stopped working we’ve had to many problems with this expensive fridge in the past 2 years. We have contacted the company but they are not willing to help. Our last fridge was also a kitchen aid and lasted us over a decade and our whole kitchen is kitchen aid and has worked perfectly for the past 16 years and still works like it did the first day we got the kitchen with no problems so we didnt expect any less from our new fridge. Highly dissapointed with this fridge. We are frustrated with this fridge. Its not fair buying something so expensive and having all these problems in such a short period if time. DO NOT RECCOMEND! Rated 3 out of 5 by Measom19 from Great looking fridge, but.... I love the style and handy compartments, but I’ve had the fridge for two years and during the first 6 months I had to replace the ice maker. Then the refrigerator periodically stopped cooling to the set temperature, and my food ruined several times. It stopped doing that, and the water dispenser started leaking non stop. We replaced the valve twice, and it is still leaking. I just keep a towel on the dispenser tray. I’m tired of fooling with it. I plan to buy another fridge...but not a Kitchen aid. 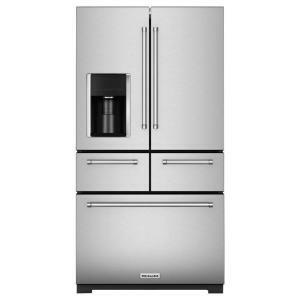 Rated 1 out of 5 by RickPitt from We just bought this refrigerator Nov 2018. Since then, the IceMaker has give us nothing but prob... We just bought this refrigerator Nov 2018. Since then, the IceMaker has give us nothing but problems. Don't bother trying to get service because I've tried to get KitchenAid to honor their basic 1 yr warranty. I'm so frustrated and honestly, just feel this is a bad appliance. All of our other KitchenAid appliances have been wonderful.